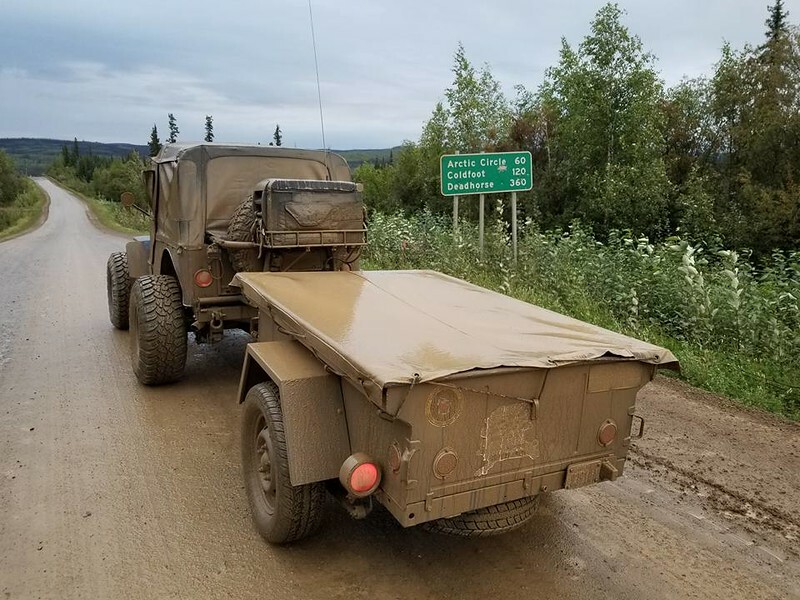 The “Alaska or Rust” vintage Jeep caravan officially came to an end late Friday afternoon, August 4, 2017, when 10 Jeeps and 22 tired adventurers passed the final Alaska Highway Marker at mile 1,422. 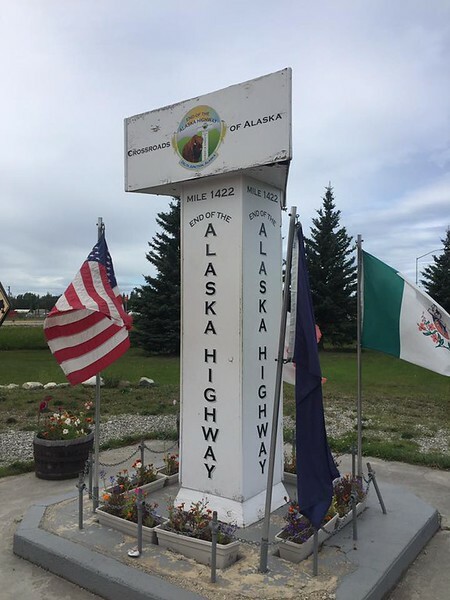 The trips from their homes to Dawson Creek and then to Fairbanks via the Alaska Highway had taken most of them at least two weeks. Now, two weeks in a vintage Jeep is enough to test the mettle of the toughest traveler, but all survived with enough memories to last them a lifetime. 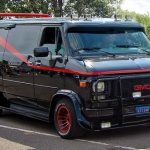 As the evening progressed, the realization of their accomplishment gradually began to sink in – they had done it! 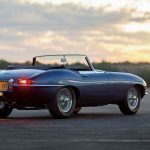 You’d think that after spending two weeks in vintage Jeeps and accomplishing all of their original goals, everyone in the caravan would take advantage of the opportunity to chill out, maybe catch up on some sleep and relax – but you’d be wrong. 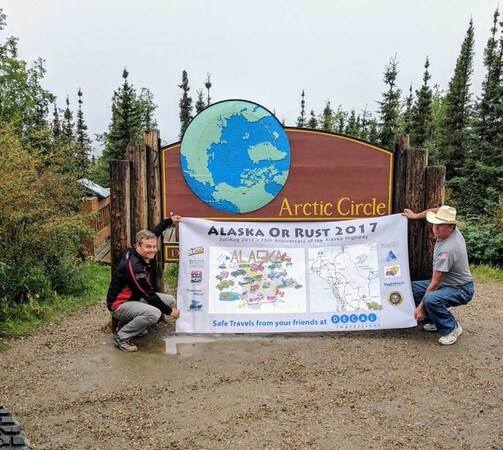 Someone in the group realized that the Arctic Circle is “only” about 195 miles north of Fairbanks and suggested that it be cool for everyone to drive up to say they had been there. 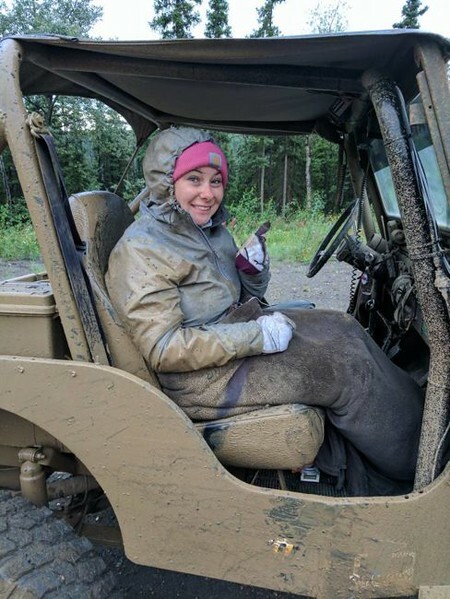 Not everyone was thrilled with the idea of driving an additional six or seven hours on a muddy gravel road on only a couple of hours sleep, but come zero-dark-thirty the next morning, four Jeeps were on the road headed for the Arctic Circle. 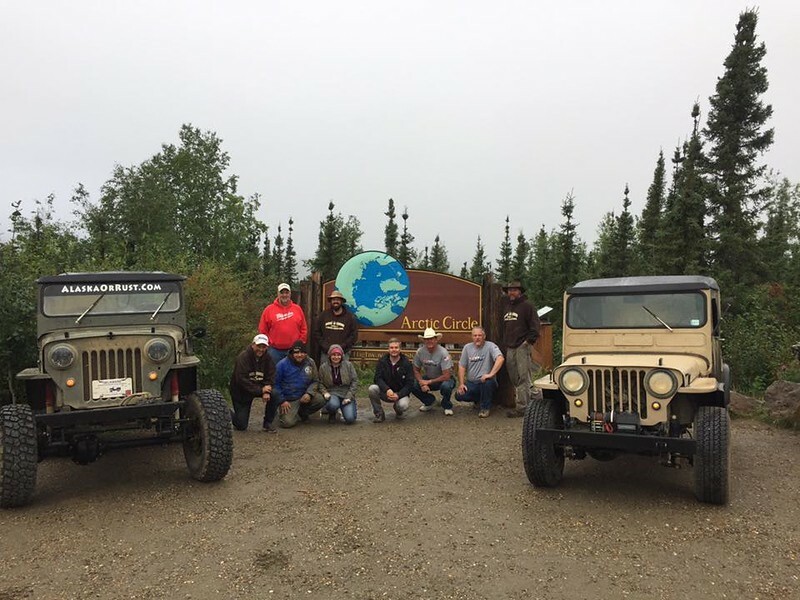 The group returned in the early afternoon with tales of running out of gas and using up all the gas in the spare gas cans, but all made it back with photos taken at the Arctic Circle. 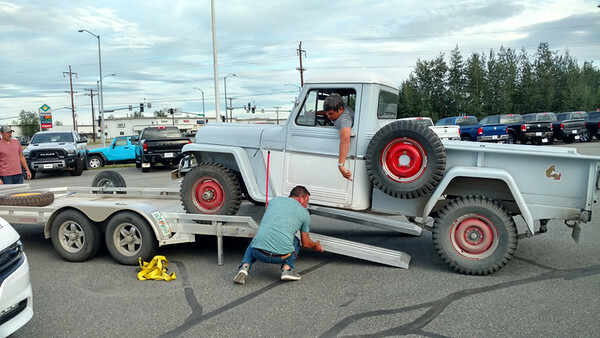 Never underestimate the tenacity of vintage Jeepers! 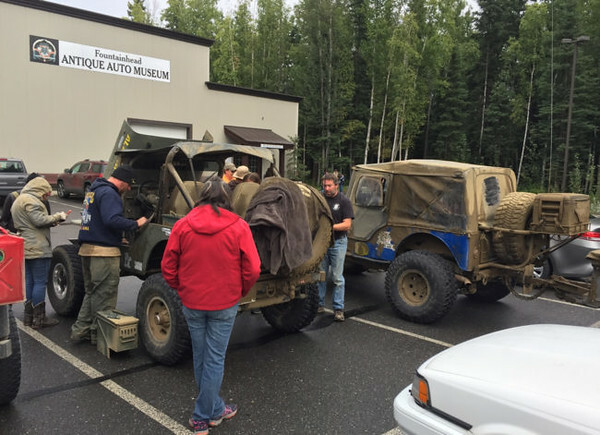 On Saturday morning, the non-Arctic Circle crew rounded up the Jeeps and headed over to the Fountainhead Antique Auto Museum for a scheduled meet-and-greet with museum visitors and local Jeep fans. 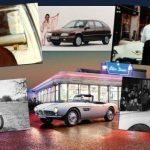 Everyone was impressed with the collection and presentation of the fabulous cars and one-of-a-kind vehicles in the privately-owned museum. Dinner late Saturday afternoon gave everyone the opportunity to chat, rehash the fun times and some of the trying times, and enjoy a great meal. Although there were no official prizes given out for the Caravan, there were awards presented that came directly from the hearts of the participants. 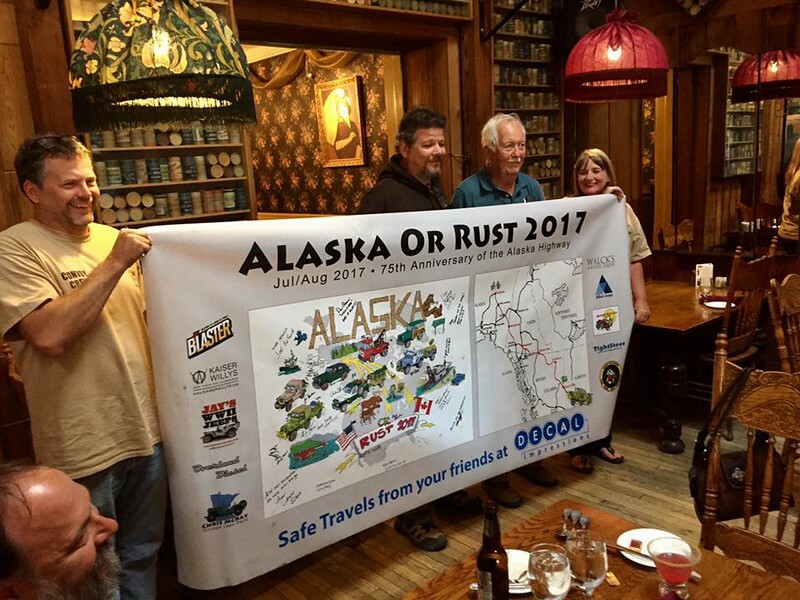 Eighty-four year old Hugo Vidal was given the Alaska or Rust banner that accompanied the Caravan, which was signed by the whole Jeep crew, for being an inspiration to everyone. David Eilers was awarded a Caravan T-shirt that was also signed by all the Jeepers for being the “Chief Cat-Herder” who kept everyone headed more or less in the same direction. David made it clear that he could not have done it without his remarkable spouse Ann. Maybe they can share the shirt! 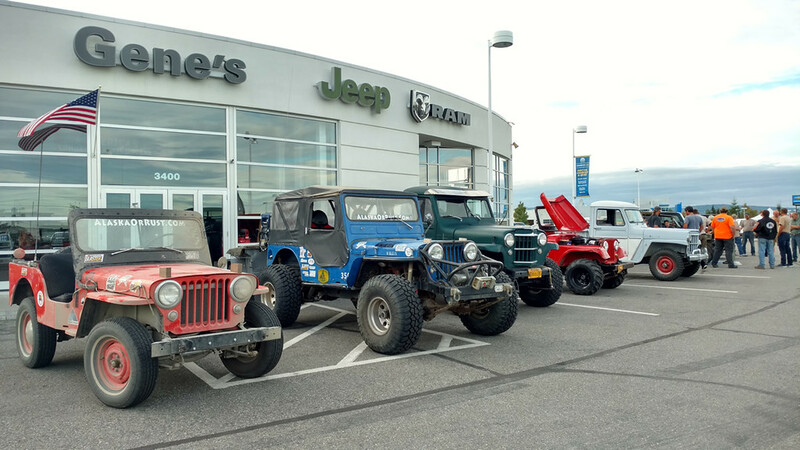 That evening, the group was invited to another meet-and-greet at Gene’s Dodge, Chrysler, Jeep and Ram dealership and was joined by several local Fairbanks Jeep owners to talk about, what else, Jeeps and Alaska. The following morning, it was time for all to go their separate ways and head back to reality. Everyone agreed that the previous day’s activities were a “fantastic end to a fantastic trip.” But, was it really the end? Is there more to come? 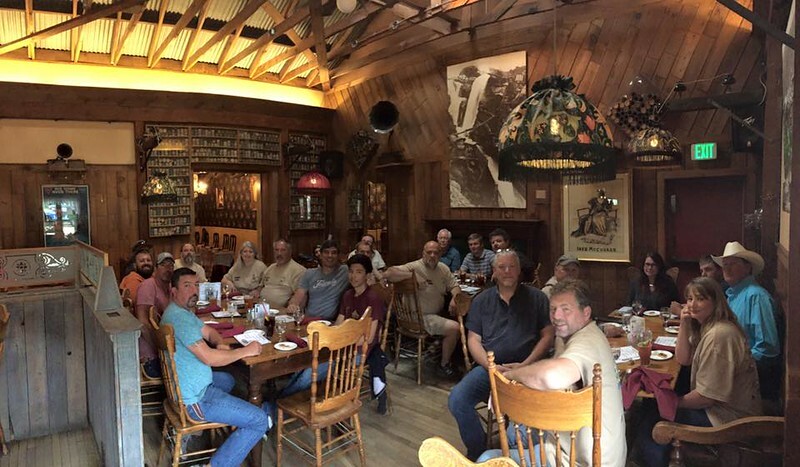 Says David, “The entire crew grew close and everyone is up for a second adventure. 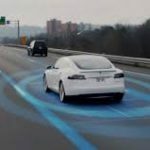 Where we go has yet to be determined.” Stay tuned for further information – we’ll pass it on as soon as it becomes available.